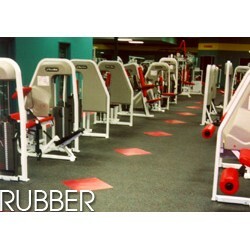 Our rubber flooring offers maximum shock absorption giving it many benefits for numerous applications including exercise rooms, food courts, child care areas, yoga and pilates, weight rooms, skating arenas, running tracks, hotels, schools, military bases and ski resorts. Our rubber flooring comes in two forms: open pore and closed pore. Open pore is a recycled material and requires more attentive maintenance. Closed pore has a virgin top layer and may or may not have a vulcanized layer of recycled rubber underlayment. TufTrack 10mm in Black. Many clubs and schools have chosen Tuftrack for their indoor track su..
TufTrack 12mm in Black. Many clubs and schools have chosen Tuftrack for their indoor track su.. Available in Sector 4 Colors. Elite, made from premium-recycled rubber, offers a high-end loo..
Rubberflex 25' x 4' x 8mm, 10% Color (Blue or Gray) Rubberflex Speckled “S” flooring, made fr.. Available in Sector 5 Colors. Elite, made from premium-recycled rubber, offers a high-end loo.. Priced per square foot. Rubberflex 8mm, 10% Color (Blue, Gray and Red) Rubberflex Speckle.. Illuminate your fitness facility with brilliant colors from the p'Eco™ collection. p'Eco™ is idea..
95% Color Steel Appeal. Elite, made from premium-recycled rubber, offers a high-end loo..
Rubberflex 8mm, 10% Color. Available in Black, Blue, Grey, Blue/Grey, Bright Red, Red/Grey, Yello..
PuzzleTile™ flooring, made from recycled rubber, was created to provide an economical, yet superi..
Elite 48" Edging to be used with 95% Steel Appeal only. Elite, made from premium-recycl..
Rubberflex 8mm, 30% Color Gold or Gray. Rubberflex Speckled “S” flooring, made from recycled ..
Elite, made from premium-recycled rubber, offers a high-end look with ultimate comfort and durabi..
Elite 48" 20% Color Edging. Elite, made from premium-recycled rubber, offers a high-end look ..